After I first got the car and there was no electrics ignition lead or anything it was simple to get to everything in the engine bay. One of the worst things was the rocker covers as they were rusted up. I wanted to at the time take them off and see if I could clean them up. I was talked out of it to start with as I was told see if the engine runs first before you spend money. That statement was rather ironic as I ended up spending a few hundred pounds on the wire loom instead. Looking back it was a sound idea to be fair. So I put the ignition on rewired the car and started it up to cut a long story short. Once it had fired I then took the rocker covers of and rubbed them down untill they were shiny steel. I then applied a couple of coats of clear lacquer over them. For a while they looked real good. Then last year we had poor weather, snow, ice you name it we had it. The damp and the weather caused some surface rust to creep back in again. So I decided on a spur of the moment to take them off again and this time treat them with undercoat primer and spray them properly. The process was simple but time-consuming this time. I removed the screws holding the covers to the head and gently lifted up. The rubber gaskets were sort of stuck to the cover and some of it to the heads. I gently eased the rubbed of the heads to be reused again. I took the covers to the man cave and removed the rubber gaskets and then cleaned the insides up of old oil and gunge etc. Once they were cleaned up I was able to get my lightweight drill out and attach a rotary wire brush in the jaws. This cleaned up the lacquer in about 5 mins all over not pressing to hard on the metal. Once the lacquer was off leaving some of the rust in place I then used the FE-123 to coat the covers and treat the rust. The treatment turned the rust black and I left it overnight in order to cure properly. The next day I then very lightly rubbed down the high spots and as there were some brush marks showing. I then applied some Frost Grey Primer to the surface. I allowed this to dry and it didn’t cover any of the brush marks up. There was a little high fill Hycote primer left from a previous piece of work that I used up. unfortunately there was not enough to go round so I sprayed the worst parts. This came up quite well. After the primers had dried about two hours later in the sun, I then used the Simoniz Wheel silver to spray the rockers. There was two coats applied to each cover and then I applied a further two coats of the clear lacquer. 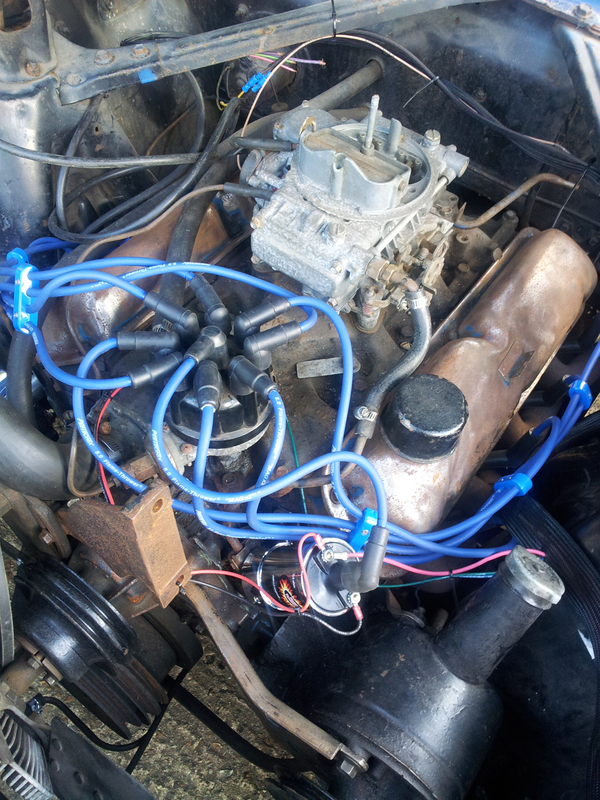 I mention the rocker covers here but I also done exactly the same process to the Oil Breather cap. The result is they look silver and they match the brake booster. OK, so they are not the Ford blue they should be, but they look good. If you inspect them closeup you can see some of the heavier brush marks under the silver from the rust treatment. Saying that I’m still pleased with them and their overall effect. I would like to have them in more natural polished steel but they look way better than rusted parts. I shall refit them as soon as I can to see what they look like in the car. At the end of the day this was a temporary measure, I will not be keeping these covers on there. I want the brushed effect with the words “Mustang Racing” on the covers in black. That will be at a later date once i start looking at the pretty bits not the essentials. For that reason alone I am not to worried about the critical details of the spray job. They will do their job, look good in process to most people and has saved me a few pounds for now. Will the paint last when she gets hot??? Only time will tell and I will let you know once I find out. If it doesn’t work I will try something else or get the covers I want. The rocker covers are in. I think they look pretty good. We will just have to wait to see how the paint lasts in the heat.